Since 2005 I have used K2, a really nice minimalistic theme for WordPress. I especially liked the spacing and the fonts used. But alas I had two people tell me that it was hard to read posts on my blog. I set out to find a new theme which was more reader friendly (especially since I am having a few longer posts). I settled with Twenty Eleven. So in a last adieu. Good bye K2. It has been good knowing you. 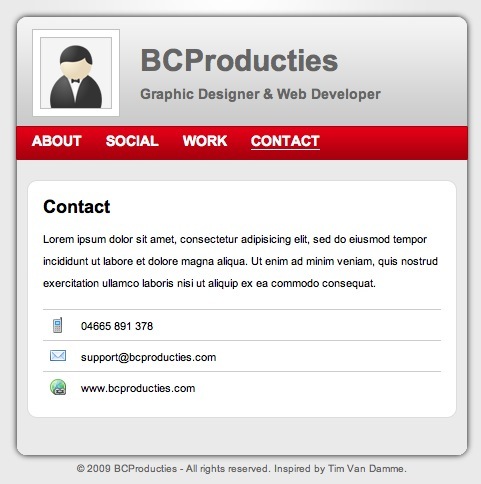 I have been looking at the WP Theme, MiniCard. It is really cool. 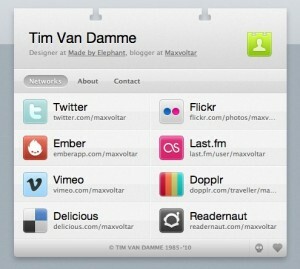 The design follows a Tim van Damme style layout. I have been playing around with Minicard for some time. I have used it as my splash page for about a year. (I have been using K2 since 2005 so any change in theme is a big step). There are some things I really like and some things I think could be improved upon. (Granted I am using and looking at the free version.) I really like the minimalist business card design. However, one of the things that I find difficult is separating what is too much info from what is just enough. Right now I have quite a few social networks loaded on my front page so, even though it is Minimalist, it is almost not business card. Most of my suggestions have to do with the options page, but a few have to do with layout. A place to store a Child Theme. K2 has a really cool way of selecting where the author wants to store their child theme so that when the theme is upgraded the child theme is not written over. Because the Code is GPL’d, I think this code could be copied from K2 into the GPL’d version of MiniCard. 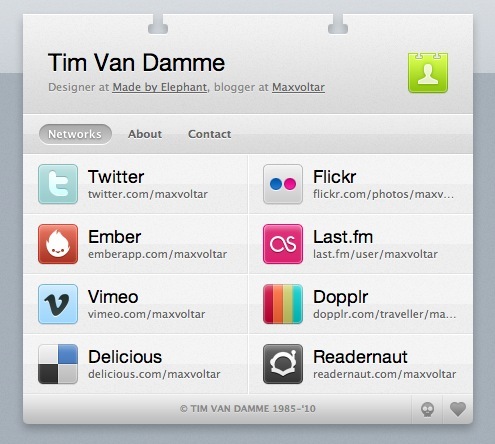 Being that the whole Tim Van Damme (TVD) idea is to be unique with style, it seems that Minicard would benefit from embracing child themes by providing a user the option to not just use a child theme, but also facilitate where to store that child theme. The Plug-in Find Me On has an interesting interface for adding new network. It is sort of Drag and Drop. I use this plugin on hugh.thejourneyler.org. A Contact Info page separate from my social networks page. One thing that might be helpful too is separating Messaging and Contact from social networks. “Messaging and Contact info” is usually treated differently from “social networks”. 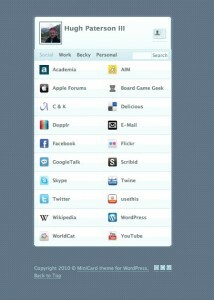 That is social network info like skype, aol, google chat, IRC, etc. are not really conceptualized in the minds of the people on the TVD wall of fame as “social networks”. If this information is provided then it most often falls under the “contact” section rather than “my social networks” section. Out of the box MiniCard does not have a contact section, so I can understand how this info is lumped together with the users social networks. Perhaps one solution to this is add an optional (included in the theme by default but not active by default) template page that could be added to MiniCard for contact info and pull data from the hCard data as well. Interesting enough Themeforest had a theme much like MiniCard. Add direct color and background pattern. There are more color options “out of the Box” on the pro version of the theme. However, the color options are not as user selectable as they could be. I have seen color wheels and a palates for suggesting associated colors as option panels for selecting css values. A color selector for the background, and the various parts of the theme would be nice. MiniCard does support hCard, but as I was looking over the format of hCard I think that more can be embedded in hCard content than what MiniCard allows for out of the box. That is I think that MiniCard could be improved with more fields in the admin section for the site admin to input their data. There is an hCard creator on the Microformats website. It shows the supported values in the hCard speck.